If you want to share a picture or a video for publication don’t forget to tell us who made it, or where you found it and how you’d like to be credited (e.g. your twitter handle). Our aim is to administer an antidote to the daily grind delivering a mix of homemade and hand-picked distractions. We are always looking for new contributors – so if you want to get involved send us some examples of your work. The Poke aims to champion all manner of new and exciting comedy talent rising up from the internet, give them a platform and then work on developing projects together. We also love fast-turnaround topical stuff. With the help of our growing army of followers we handpick the funniest stuff on the web delivering up to 10 daily updates. We have amassed over 2 Million fans who have signed up to Google+, Facebook, Twitter, and YouTube feeds plus our weekly newsletter. Greg James told his Radio 1 listeners “The Poke is one of the funniest, most retweeted accounts on Twitter” and former Deputy PM John Prescott reckons that a retweet by The Poke is better than a peerage. We remixed Deputy Prime Minister Nick Clegg’s tuition fees apology speech video – which chalked up 2.2 Million views on YouTube. It went on to become a Top 40 hit in the iTunes download chart. The video was singled out as one of YouTube’s Top 10 Defining Moments Of The Year Read more about what happened > here. 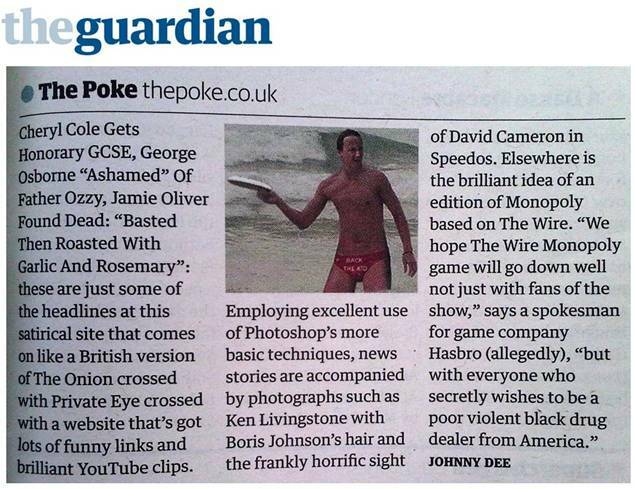 The Poke was featured on a Greg James BBC Radio 1 documentary about internet trends and several of our videos have made appearances on Channel 4’s Rude Tube as well as Have I Got News For You, 8 Out Of 10 Cats, Graham Norton and Russell Howard’s Good News. Leveson The Musical topped the Guardian’s Viral Video Chart and got nice write-ups in the Daily Telegraph and Huffington Post. We’ve also had a bit of attention across the pond – in outlets like Time and in The New Yorker and New York Times for our Mad Men Mr Men comic strip. We had 5000 requests for poster for our Daily Mail Tube Map – however Transport For London’s legal department weren’t very keen on us printing them so we didn’t. One of our stories about a zombie invasion caused quite a stir in French media. We have have supported, LOCO London Comedy Film Festival, Dave’s Leicester Comedy Festival, The Smalls Film Festival, Popcorn Comedy and Manchester’s CoFilmic. Read what > The Guardian thought. 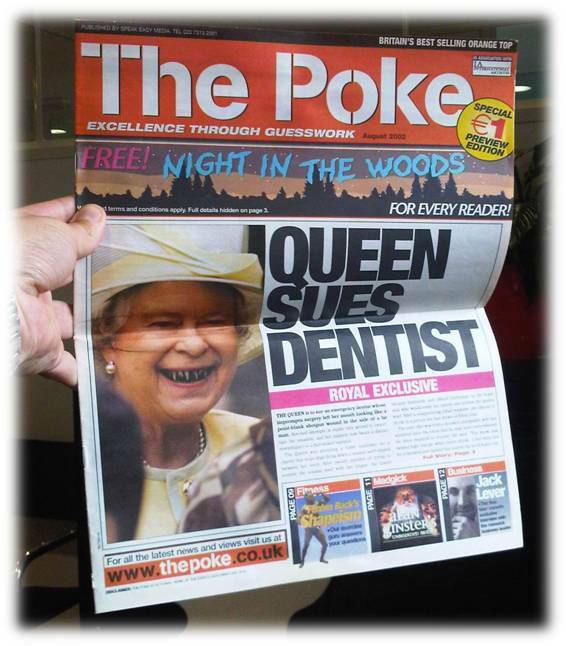 The Poke was founded in Aug 2002. It started life as a magazine. 50,000 copies were printed and distributed via independent record shops and up at the Edinburgh Festival. The idea was to provide an outlet for upcoming comedy writers. Content on The Poke: All original Poke editorial content remains the copyright of The Poke. Email: Your email address is only collected if you choose to either leave a comment on the site, register on the site, or sign up for our email subscription. Instructions on how to opt out after subscribing are included in the bottom of each email. Your email will never be sold or shared with any third party. External Site Links: This site links to other websites on the internet. Content and privacy policies are the responsibility of their respective owners. Advertisers: Most advertisements on The Poke are provided by outside advertisement companies and may contain cookies. These cookies are collected by their respective companies and are not accessible to The Poke. IP Addresses and Logging: The Poke server logs information about visitors, including IP addresses, date/time visited, referring website, length of stay, etc. This information is used for site statistics only. Author Statements and Comments: The Poke is a multi-author site and any opinions expressed by the authors in posts or comments do not necessarily reflect the opinions of the authors as a group or of The Poke and it’s owners. The Poke and or its owners take no responsibility for statements or opinions expressed by it’s authors. Posts are edited for content with regards to content policy but are not otherwise edited. Content Policy: The Poke is a humor site suitable for an adult audience. Adult language is allowed as long as it is not overly excessive and the post is clearly marked as being “not safe for work” (NSFW). We do not censor our authors statements, except to comply with our comments policy, and encourage them to exercise their freedoms of speech and opinion. Crediting Sources: We accept submissions from a wide variety of sources. Due to our high volume of posts and submissions we are not able to always verify the original source of content. Due to the nature of the internet and the widespread availability of the content we use, if we have used your content and not credited you, we ask that you send us an email containing the original URL of the content and we will update the post as soon as possible.